Shopping for Bob Ross Bobble Heads? This isn't a mistake - it's a happy little accident! This exclusive bobble head of Bob Ross is HUGE! The artist is joined by his pet bird, raccoon, and squirrel, plus an easel and paintings. Each Royal Bobble comes with a unique serial number. Start painting a world of happy little trees and clouds! 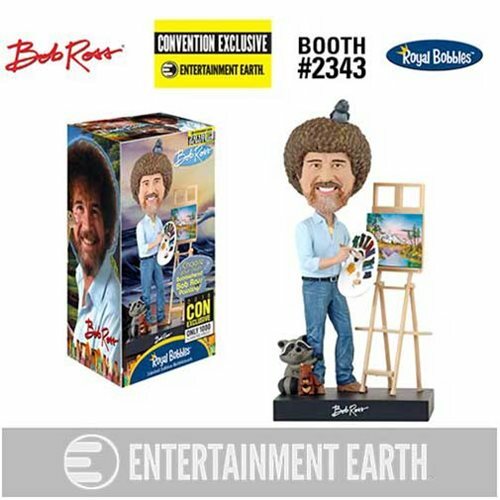 If you need a little inspiration to start painting a world of happy little trees and clouds, bring home the man who taught us all The Joy of Painting. This delightfully detailed polyresin bobblehead features the artist himself, standing at the ready with paint brush and palette in hand. 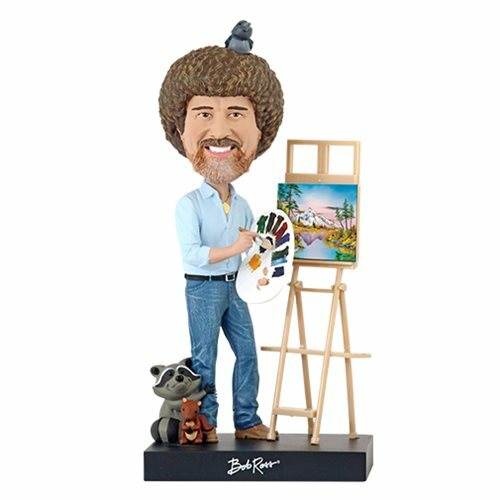 Bob Ross is joined by his pet bird, raccoon, and squirrel, as well as a removable easel with a choice of 5 different Bob Ross paintings. Each Royal Bobble comes with its own unique serial number located on the bottom of the base to indicate authenticity. The Bob Ross Variant Version Bobble Head - Shared Exclusive measures about 10 1/4-inches tall x 5 1/2-inches long x 4 3/4-inches wide! Ages 15 and up.